Somehow the birthday check Grandma sends never seems to last as long as you think it will. The stereotype of a broke college student is a reality too many students know all too well. But what can be done to prevent it? Luckily, if you call Temple your home, on-campus jobs can provide you with enough money to not eat ramen every night. You’ll also probably have a great time working (but we won’t tell anyone). RAs are part of everyone’s college experience. They lived down the hall from you and were in charge of writing students up, keeping the peace on the floor and simultaneously acting as your mother, teacher, therapist and nurse. The upside? RAs receive free room and board, which means they live and eat for free on campus. You could make a few bulletin boards every now and then for that. Huge mobs of high schoolers, overexcited parents and one eager college student in a red polo. Yes, you know who I’m talking about. We all see the large tour groups in the library, tech center or around campus. Well those tour guides are students on the clock and getting paid. The job won’t make you rich (it only pays minimum wage), but who wouldn’t want to be the face of the university? Owl Ambassadors work on the front lines and are basically walking brochures for Temple. Owl Team Leaders take it one step further. 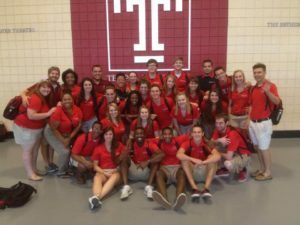 These students work during summer orientation. They are assigned a group of incoming freshman and hold icebreakers (stop cringing), answer questions and become the first friendly face for new freshmen. It’s an important job, plus you get close to fellow team leaders and end summer with an extra $2,000. There are horror stories of people quitting this position by shouting “I quit” and barging out during a shift. Beware; this job is not for the weak of heart. While this position pays a dollar over minimum wage and includes bonuses, the trade-offs can be costly. The term “student fundraiser” sounds a lot more glamorous than it is. In reality you call alumni, friends and family of the university to ask for money. The catch? You have to ask four times even if the person says no on the first ask. This job teaches how to deal with rude people without bursting into tears. It will help you be professional and persuasive, which can be beneficial in the future. The hours are flexible and the boss is pretty cool. Nobody is entirely sure what students who work at the gym actually do. It seems to me that their job of swiping student IDs could be done with a computer. Usually their workdays consist of staring blankly off into space or judging you for struggling through your low-level workout. However, these students also clean equipment and help keep the fitness centers running smoothly. Want a job where you can catch up on reading for class? Then this job is definitely for you. These students will be your saviors when you find yourself locked out of your room. You will get to know the front desk workers pretty quickly. They sit behind the desk and make money even while surfing the Internet. It’s a low-pressure position and you get to know a lot of the housing staff. The connections will come in hand if you want to apply for an RA position in the future. Famously known for sporting the t-shirts that read “I Speak Textbook,” you have to respect the students who work at the bookstore during the back to school months. Dealing with oblivious freshman, presumptuous parents and stressed out managers can’t be a fun combination. But hey, somebody has to do it.